In LULU v.7 // aspects of a femme fatale, currently playing at Buddies In Bad Times, the creative team re-interprets Frank Wedekind‘s 1894 play Pandora’s Box. Lulu is sexually voracious, and either a malignant temptress or a victim of men who only see in her what their lust wants to see. “Why not both?” you may ask, and I and the show both agree. 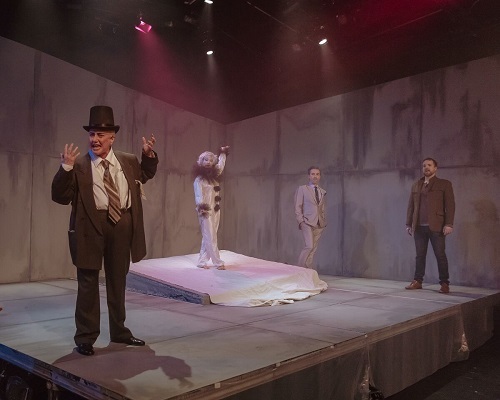 This productions’ first act is an atmospheric and inspired rendering of Lulu as both, including a meta-theatrical critique of the text and its place in patriarchy. The meta aspect is apparent upon first entering the theatre, where there is a stage on the stage. The action from Wedekind‘s script happens on this raised stage, while the area around it allows for other things, like distorted voice-overs and table-tops that can be projected on the back wall. This last serves some practical purposes. For example, when a table covered with green matting is used for shuffling cards and laying down poker chips, the projection on the back wall sets the scene at a casino. But the fact that we can see the performers manipulating the cards and chips, and the camera, reminds us that this is not real: Lulu and her surroundings are a product of the time, and of a man’s mind. Lulu’s lovers all end up dead, but it’s hard to blame her for it, even when she has literally pulled the trigger. Her father and her adoptive father both sexually abuse her, and the other men pour her into whatever mold they prefer. She has no agency, but she also has very little personality. This is the way Wedekind wrote her. He may have been pro-women’s sexuality, but that doesn’t mean he had enough insight into a woman’s mind to write one believably. This production uses the character deficiency to layer symbolism, criticism and commentary, using costume (or lack thereof), makeup, spoken word, singing, props — pretty much any stage device you can think of, and maybe some you haven’t. This could be an incredible one act show. But instead there’s a second act. In the second half, various things happen that have very little to do with one another. The narrative through-line is abandoned and the thematic through-lines are distracted or abandoned. There’s an academic discourse on the patriarchal construction of academic discourse, which is interesting and has something to do with the show. But there’s also a movement piece about Persephone, a scene that seems like a therapy session, and something where everyone wears white paper suits and pink wigs and rolls over each other across the stage. There was one moment that pulled me in: a speech about being a gay man in Toronto, with the disappearances that we now know are murders, and the absurdities of police communications. It was finely crafted and delivered. I still, however, have no idea what it had to do anything else in the show. Unfortunately, for me, the effect was boring. A farrago of scenes that are dark and slow make me lose focus. When the fast and loud part came, it didn’t feel earned. It felt like they had to do something frenetic at the end because a play needs a climax, with no real other reason. This show has been in the works since 2014 — as the title indicates, this is version number seven. So my companion and I wondered if the scenes in the second act appear to make sense to the creative team because they have developed them in different productions over time. It’s pure speculation of course, but it does seem like these people have put a lot of thought into their work. I just wish they had taken the few engaging aspects of the second act and incorporated them into the first to make a more coherent production.